Tropical fish jump out of their water tanks on either side of the screen. You have to move the man left and right to catch them in the fish bowl and deliver them back to the tanks, or they will land on the floor where the cat will catch them. 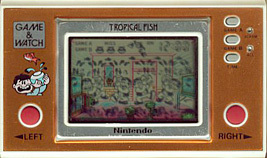 You score one point each time you catch a fish or deliver a fish back to the aquarium. The speed and number of fish increas as you gain points. At each 100 points the action slows down temporarily. At 300 points any misses you have will be cancelled. The fish jump out of the right tank and move left across the screen. Deliver them to the tank on the left. Fish jump out of both tanks, and may move left or right after jumping out of the fish bowl. Deliver them to either tank.